Our people love what they do. It’s all for the privilege of doing great work – for ourselves and for our clients. 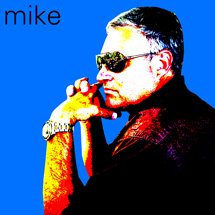 Synonymous with Witherspoon work and client success for more than 35 years, Mike has been in charge since 2005. He’s hands-on with every client’s challenges. And he’s hands down, one of the most experienced professionals in Southwest advertising. If you had a warning label, what would it say? Avoid exposure to the status quo. Is great advertising still a turn-on? At its best, it is a window to our culture and is never boring. What hidden talent would people be surprised to learn about? I can fix most mechanical things. Who is your all-time favorite musical group? The Beatles. They produced a game changer, more than Elvis did, and their lyrics are the best. Period. What amazing accomplishment did you achieve before age 10? I could drive a car. When do you remember feeling real career satisfaction? When our client at Hobbs Trailers asked me to be the AE on the account. I was honored to be a pallbearer at his funeral years later. What’s important to accomplish before you die? I want to see my family live well as a result of making the right choices in life.